In many areas of the rural United States, October brings two quintessential fall activities: hunting for an ideally shaped orange squash at a bucolic pumpkin patch and—for the more adventurous—navigating an intricate maze cut into a massive cornfield. Friendly farm owners open their property to visitors for other fun attractions, too—petting zoos, hayrides, mini mazes for children, straw “mountains” to climb, slides and tunnels to explore, and much more. If your travels take you to any of these areas in the coming weeks, be sure to check out these opportunities to embrace autumn with a day at the farm amid huge corn mazes and pumpkin patches. 1. Cool Patch Pumpkins (Dixon, California). Matt and Mark Cooley of Cool Patch Pumpkins, southeast of Sacramento, hold the record for the world’s biggest corn maze: It was 60 acres in 2014. In fact, the maze was so intricate that year, local 911 dispatchers reported that lost maze goers were calling them to get rescued! This year, the maze features loopy circles and a giant Sacramento Kings logo and measures 43 acres, but is no less entertaining to navigate. More than 50 varieties of pumpkins are grown in the giant pumpkin patch here; pick your own for making a crafty jack-o’-lantern or baking a pie (the on-site pros will guide you to the best varietals for decorating or eating). 2. Richardson Adventure Farm (Spring Grove, Illinois). This beloved family farm dates back to 1840 and is located northwest of Chicago, close to the Wisconsin border. It offers multiple corn games and puzzles in its 33-acre corn maze. In another nod to professional sports, the design here celebrates the 2015 Stanley Cup champions, the Chicago Blackhawks. The outdoor activities at Richardson Adventure Farm are vast: giant jumping pillows, pony rides, pig races, gemstone mining, paintball shooting, corn cannons, and even a zip line. Pick-your-own pumpkins here range from tiny gourds and differently colored (even blue) pumpkins to “warty” and traditional big ones weighing in at 30 or more pounds. 3. Hathaway Farm (Rutland, Vermont). Dubbed the largest corn maze in Vermont at 12 acres, the Hathaway Farm corn maze in rural Rutland introduced some digital entertainment this year: a smartphone app that allows visitors to collect the digital checkpoints and use a GPS map of the maze to see where they’ve been or where they’re going. Clues are scattered throughout the maze, whose theme is “Under the Sea” this year, and there’s always the “early exit” if you just need to get the heck out! The mini maze with its own special pint-size checkpoints is ideal for preschoolers. 4. Twin Cities Harvest Festival and Maze (Brooklyn Park, Minnesota). “Minnesota’s largest corn maze” northwest of Minneapolis measures just under 20 acres with a design celebrating the 15th anniversary of the Minnesota Wild National Hockey League team. (I like that a portion of the ticket fees goes to the nonprofit Minnesota Wild Foundation supporting pediatric medical causes.) Family fun here includes a smaller straw-bale maze, a petting zoo, hayrides, pony rides, a “pumpkin slinger,” and more. 5. Roloff Farms (Hillsboro, Oregon). Made popular in the television show Little People, Big World, Roloff Farms attracts thousands of visitors to its rural playground northwest of Portland during the pumpkin season of October. Viewfinder Tip: Bring bottled water and energizing snacks into giant corn mazes just in case it takes you a while to find your way out! The three-acre pumpkin patch is free to enter; just pay for the pumpkin you want to bring home. Also for sale on the property are Roloff Farms pumpkin salsas in three varieties: Pumpkin Verde, Pumpkin Peach, and Pumpkin Corn. But the real fun comes with entrance to the Adventure Area, where visitors of all ages can play with giant slingshots, climb on a hay pyramid, ride the kiddie train, or explore tepees. A wagon tour of the farm features many of the attractions you may have spotted on the Roloffs’ TV show. 6. Summers Farm (Frederick, Maryland). This year’s corn-maze design at Summers Farm is…Taylor Swift! Yes, an image of the singer’s face at a microphone is cut into 12 acres of corn. This farm that also features an amazing variety of activities and brilliant photo ops: apple blasters, rubber-ducky races, animal tire swings, ringtoss, face painting, and mini golf. Take a free hayride to the 15-acre pumpkin patch at Summers Farm to pick your own pumpkin and pay by the pound. 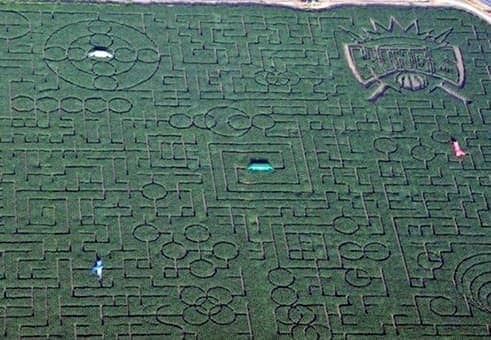 For more corn mazes in the United States check out this handy directory. How you do celebrate the fall season?